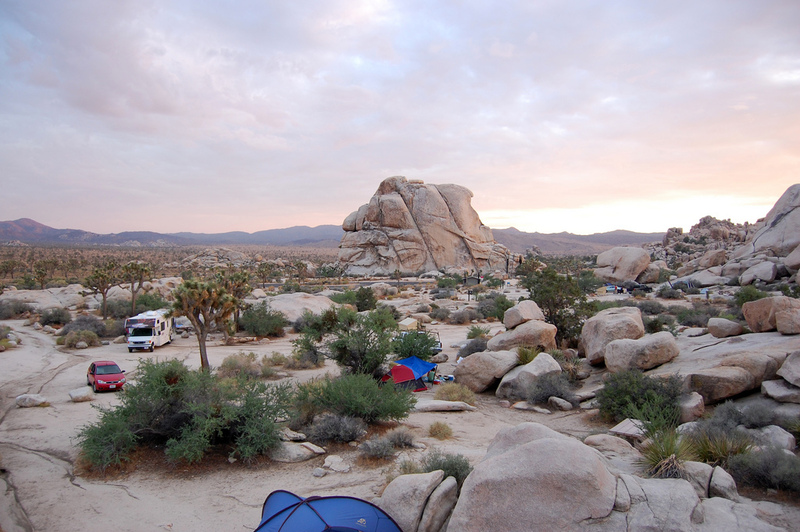 There's no question about it: Joshua Tree camping is some of the best camping in Southern California. And all of California... and the entire country, frankly. From its iconic, otherworldly flora and fauna and epic stargazing to its gigantic boulders and world-class climbing, this is one of the best places to pitch a tent, build a fire and feel at one with nature—and we're here to tell you how. Just two and a half hours east of Los Angeles on the 10, the park is close enough for a weekend getaway while still feeling worlds away from the city. 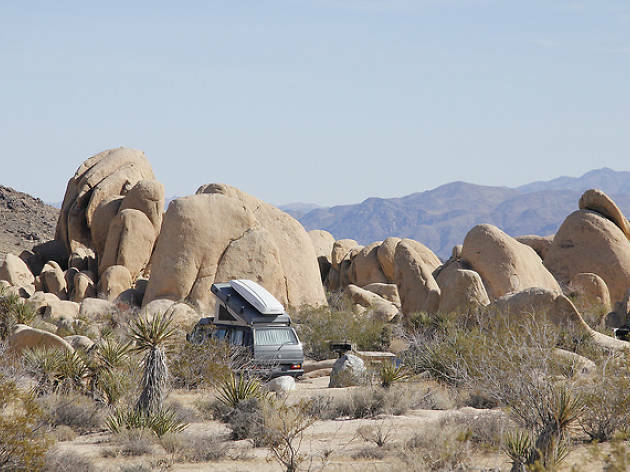 It's just east of Idyllwild and Palm Springs, and just north of the Salton Sea, so if you have time, you can hop from one desert destination to the next. Anytime! 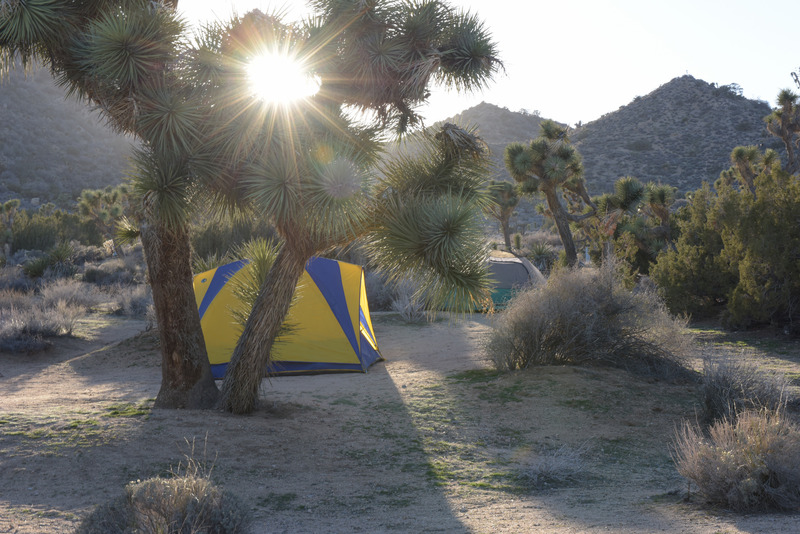 The park is open year-round, and if you don't mind extremely hot days in the summer and extra chilly nights in the winter, you'll be fine no matter the month—just be sure to bring the right gear for the season. Springtime—between March and early June—is the most popular time in the park, due to warm days, cool nights and an abundance of Southern California wildflowers. What if I don't want to camp, or all the campsites are full? You have a few options. 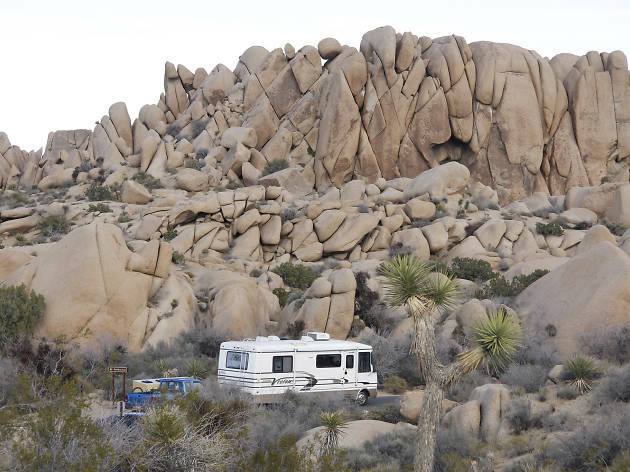 If you don't mind coughing up some extra cash, you can check out the charming, eclectic Joshua Tree hotels in the area. Or if you're okay with a more, er, rustic camping experience, you can find a map of BLM land (that's Bureau of Land Management), where it's technically legal to camp anytime. Or, if you have the gear and time (and the appropriate permits), you can choose to backpack instead and camp in the back country region of the park (just remember, no toilets, fire rings or picnic tables out in the wild). The per-vehicle entrance fee to the park is $20, which is good for a seven-day stay. If you happen to be arriving on foot, motorcycle or bike, the fee is $10. 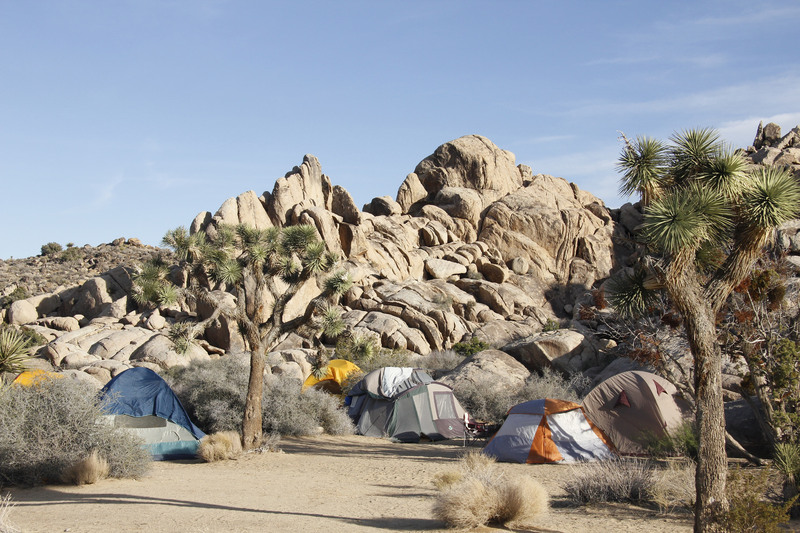 On top of that, you'll pay $15 per site per night, or $20 per night per site at the three campgrounds with potable water. 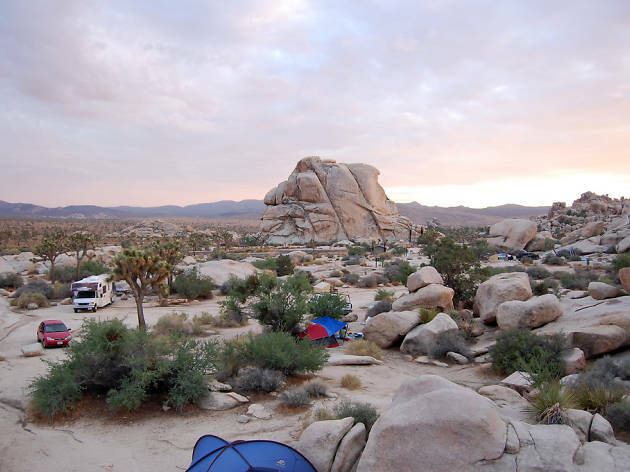 Most campgrounds in Joshua Tree are first-come, first-served—the park can get extemely busy on weekends from October through May, so if you can camp during the week, or try to arrive Thursday night or early Friday morning, you'll improve your chances of finding an open site. Black Rock and Indian Cove campgrounds do offer reservations (available for booking up to six months in advance online or at 877-444-6777) from October through May; in the summer, all sites are first-come, first-served. Aside from the essentials like a tent, sleeping bag, sleeping pad, etc., you'll definitely want to bring firewood—the nights get cold and wood is not provided. And only three campsites in the park offer running water, so it's very important to bring as much as you'll need for cooking and cleaning, as well as staying hydrated during long, sunny days. (There's a coin-operated spigot just inside the entrance to the park, if you'd prefer to bring empty jugs and fill up on site.) Most campsites are equipped with fire grates for cooking, though you're welcome to bring a camp stove. And while each site has a picnic table, camp chairs for sitting around the fire are always nice. Aside from that, it's the necessities (sunscreen, sturdy shoes, etc.) and the fun stuff (card games, a guitar, s'more fixins), which is up to you. 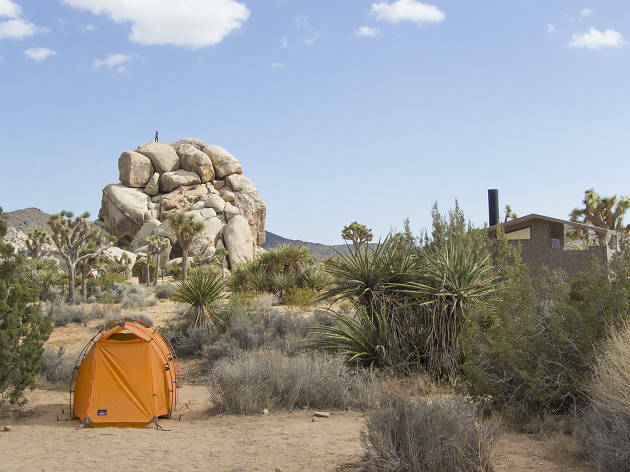 We've outlined each of the park's nine campsites below with everything you need to know to choose the best one for you and your group. 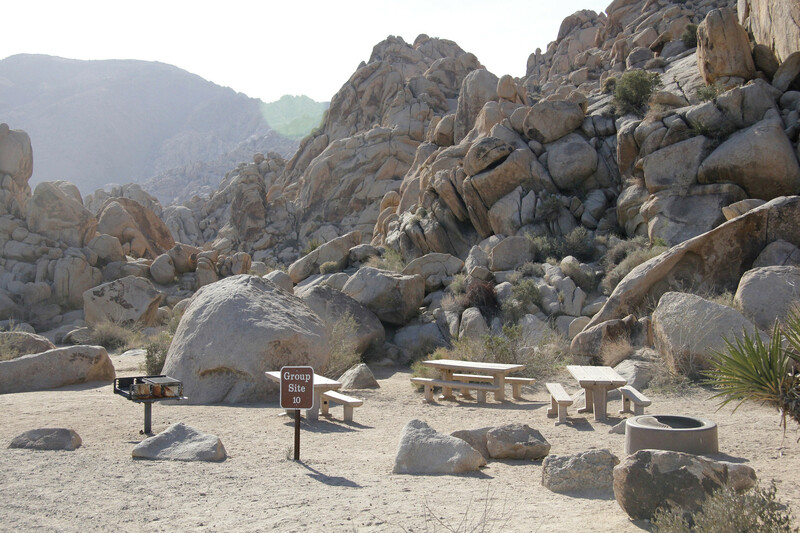 This campground is located in the northwest corner of the park, alongside the Little San Bernadino Mountains. 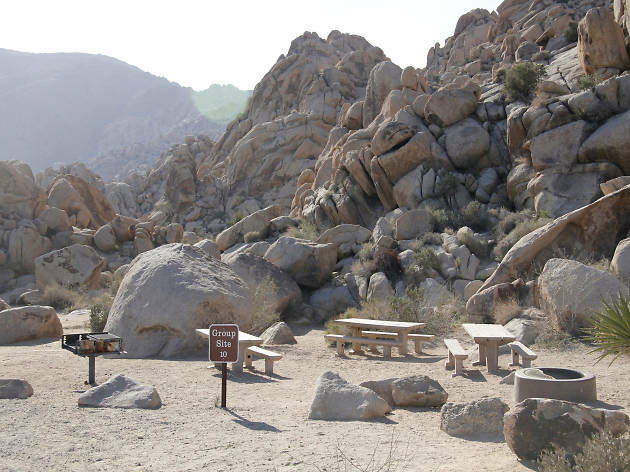 It's one of the first you'll reach when driving from LA, and is convenient for trips to stores and restaurants along 29 Palms Highway, but has no direct access to the rest of the park—for that you'll have to drive another 12 miles to the park's west entrance. That being said, the sites here are lovely, located on a hillside and surrounded by some of the park's stateliest Joshua trees, junipers and cholla cacti. This site has easy access to the 1.3-mile Hi-View Nature Trail, along which you might see herds of big horn sheep or mule deer. 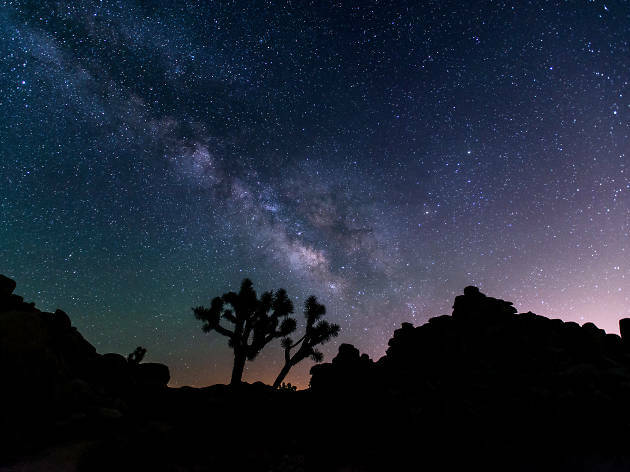 If you're up for a longer hike, there's access to some of the highest peaks in the park—take a night hike and you'll see the shimmering lights of the Yucca Valley below. With 101 sites, Indian Cove is the second-largest campground in the park. It still fills up quickly, however; the towering rock formations throughout the area make it popular with climbers and hikers. 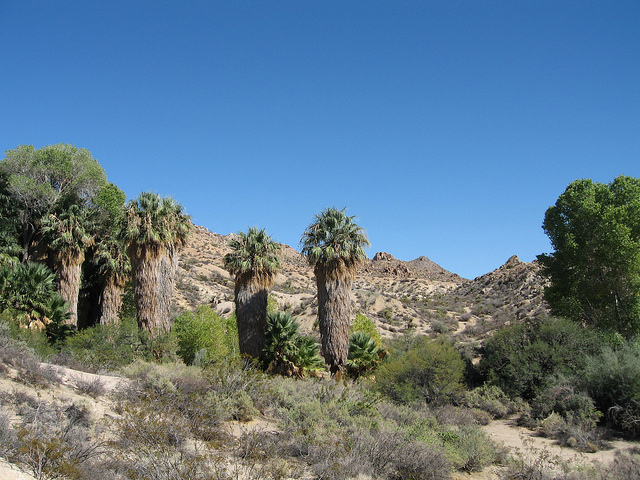 Here you'll see Mojave yuccas, spring wildflower blooms and the rare desert tortoise in spring or early fall, or the Le Conte's thrasher (take note, birders!). 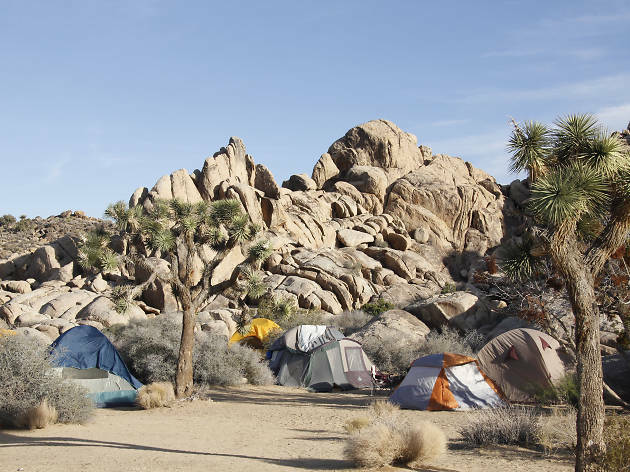 The campground is just south of the highway, which makes it easily accessible to the amenities of town, though it's a bit of a trek from here to some of the park's more well-known attractions. Hidden Valley is one of the park's most beautiful places to camp—that is, if you don't mind climbers scampering atop every rock in sight at all hours of the day and night. This is a world class destination for bouldering, rope climbing and the daring feat of the free solo—a tall climb with no ropes at all. Hidden Valley is tucked perfectly within some of the park's most impressive rock faces, making it feel cozy and protected despite all the high adrenaline activity. It's a social camp; some climbers shack up here for weeks at a time, and rangers come by on weekend mornings for Climbers' Coffee, offering free coffee and tea on a folding table piled high with local climbing guidebooks. 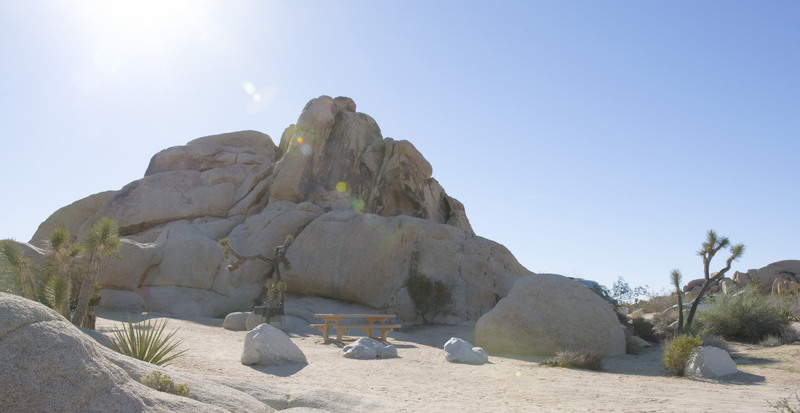 There's plenty of exploring to do around here, and it's a close hike to nearby Barker Dam. Do note that it can be incredibly difficult to find an open site—if you're looking for crowded, friendly fun it's worth the attempt, but if quiet time and privacy is more your speed, better to look elsewhere. 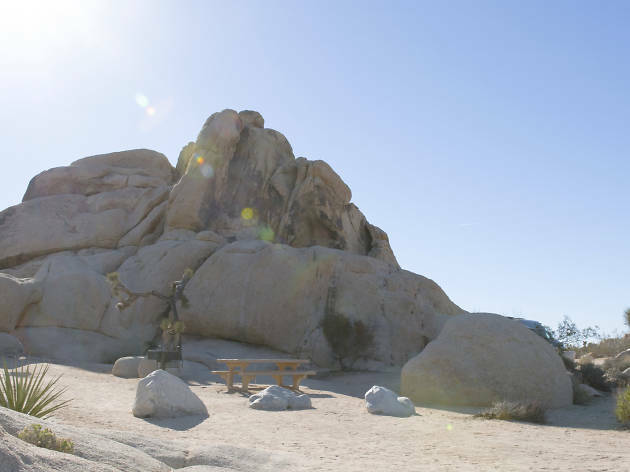 This campground is known for three things: its proximity to the ruins of Ryan Ranch, incredible sunsets and great climbing on the giant boulders strewn throughout the grounds. Ryan Ranch was built in 1896 by the J.D. Ryan family, profitable miners in the area responsible for the Lost Horse Mine three miles south. The home was destroyed in a fire in the '70s, but the foundation and brick fireplace remain, as does the small cemetery nearby with 10 graves (if you're into spooky ghost stories around the fire, Ryan is the campground for you). If you're more interested in the sunsets, be sure to nab a site on the west side of the camp. Sheep Pass is designated for group camping only. Each of its six sites can accommodate between ten and sixty people, so unless you're rolling deep with your friends, you may want to steer clear. If you're planning a party or running a summer camp, however, this is the place. There are usually birthday parties, family reunions and Boy Scout campouts dotting the area. Despite being huge and often full of noisy humans, it’s still very beautiful and has easy access to Ryan Mountain hiking trails—perfect for the moment those school buses show up. 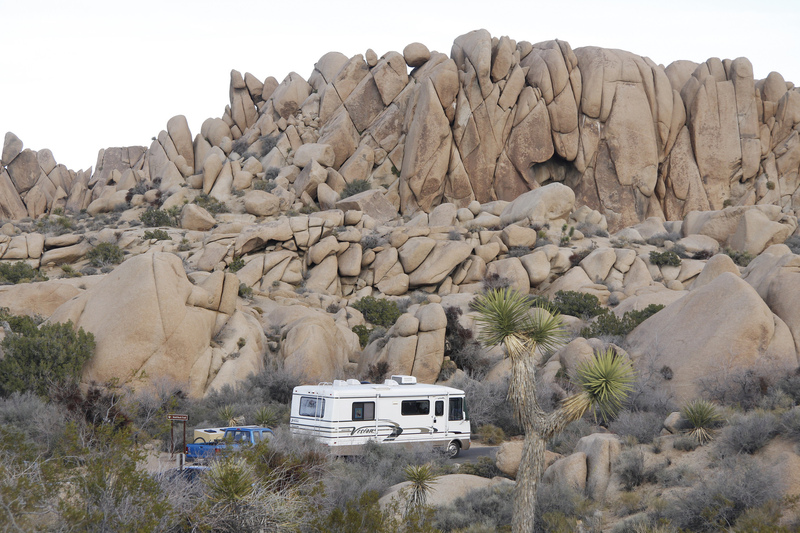 This is the largest campground in the park, both by number of sites and scale of rocks. The eponymous Jumbo Rocks loom over surprisingly private sites and easygoing trails, making it easy for a quick scramble up to some interesting rock formation or choice lookout point. And you don't have to be a real climber to partake—there are more than enough rocks here suited to kids and beginners. And speaking of kids, there are plenty here; Jumbo Rocks is one of the more family-friendly sites in the park. 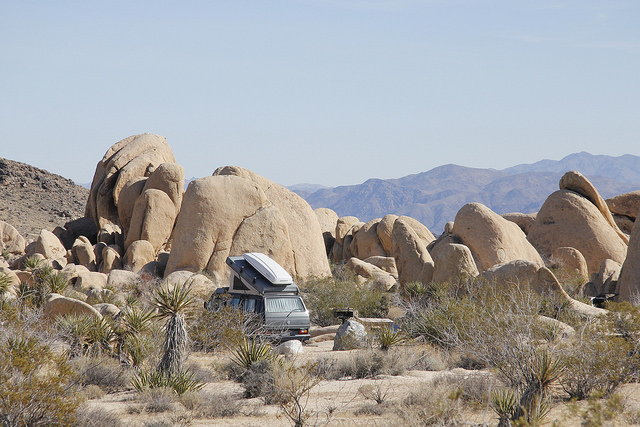 Belle is a small, often-overlooked campground, as it's a bit far from the park's more popular desert highlights. But it's also one of the quietest sites in the park, as well as the darkest, which makes for some spectacular stargazing. It's a great option for romance, or for those who like to turn in early. From here, there are views of and backcountry access to the Sonoran Desert and Pinto Basin, large swaths of pristine, sprawling desert landscape. 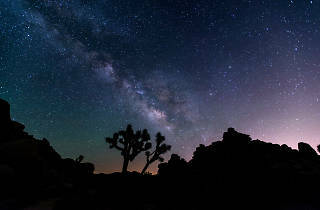 Nearby to Belle and a bit cozier (coming in at 15 sites, the smallest in the park), White Tank is another secluded, dark spot for uninterrupted stargazing. An easy hike on the Arch Rock Nature Trail (begin at site 9) leads to Arch Rock, a granite arch 35 feet wide and 15 feet high. 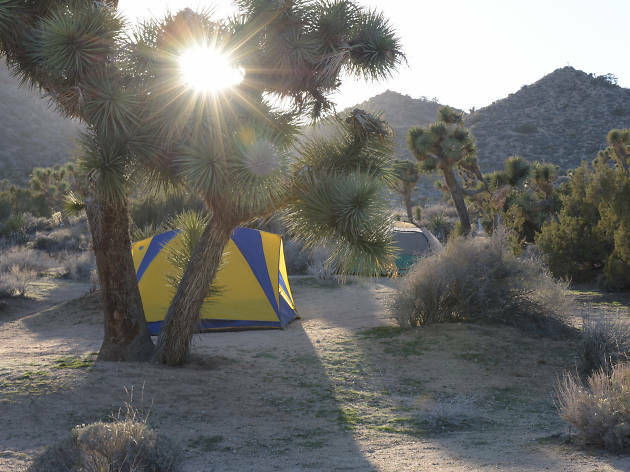 It's one of the park's rarest sites—Joshua Tree isn't known for its arches—and is well worth a visit, even if you're camping elsewhere. Cottonwood is a unique campground; it's the only one out of nine that's more easily accesible from the south entrance of the park off the 10. It's in the Sonoran Desert (not the Mojave, like the northern portion of the park), so you won't find any Joshua trees here. Being low desert, it's also a bit warmer than in the rest of the park. 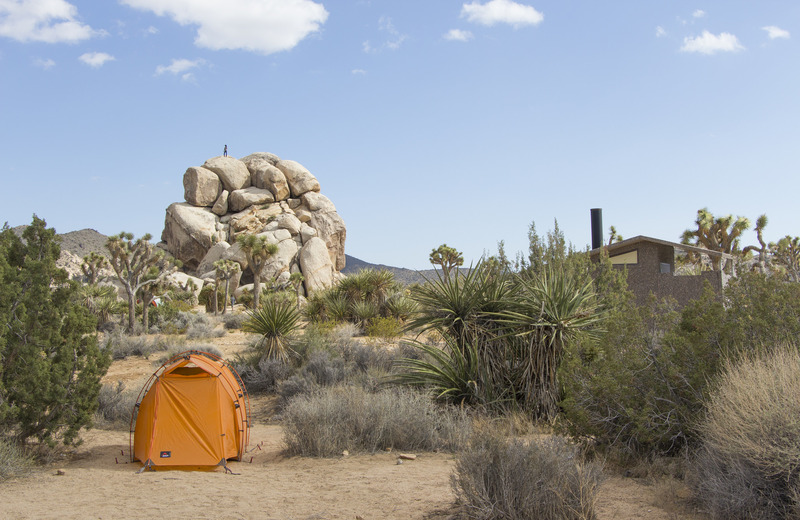 The campground is secluded, but close to attractions like the Cholla Garden and Ocotillo Patch, plus plenty of hiking trails. And it's just a half-mile hike to the Cottonwood Spring Oasis, one of the park's best-kept secrets. This natural spring was used for centuries by the Cahuilla Indians, then prospectors, miners and teamsters. Gold mills were built up around it, and the remains of some can be found near the oasis, which is an impressive site in itself with its lush, tall palms asserting themselves in the middle of the desert.